New York City reached a grim new milestone at the close of 2017: Last December, an average of 63,495 men, women, and children slept in City homeless shelters each night – an all-time record. To put this in context, only nine cities in the entire state of New York have populations larger than New York City's sheltered homeless population. Three-quarters of New Yorkers sleeping in shelters are members of homeless families, including 23,600 children. 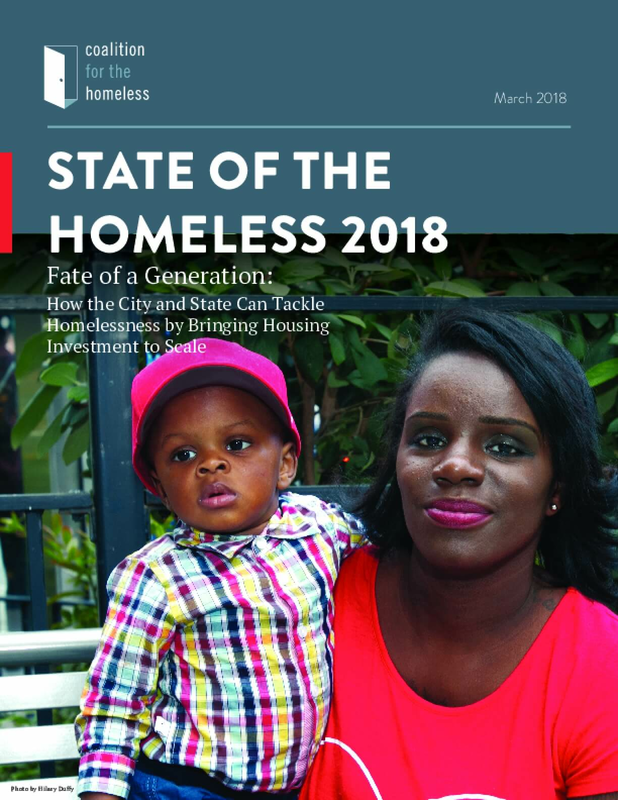 An 82 percent increase in homelessness over the past decade speaks to the severe shortage of affordable housing – fed by the combination of rising rents and stagnating incomes – along with devastating policy decisions that have limited access to affordable and supportive housing for homeless and extremely low-income New Yorkers. State of the Homeless 2018 articulates the steps necessary for the City and State to make a meaningful and lasting impact on this tragedy of historic proportions. Copyright 2018 by Coalition for the Homeless. All rights reserved.